Apparently, having a little rim on a piece of lead shot somehow slices and dices a pheasant into thousands of julienne fries in seconds or something like that, so if you cleverly miss your pheasant with 70% of your payload, the 30% deformed pellets step in to do the job. It is a ridiculously goofy idea, with no basis in fact or physics. Perfectly round shot shot flies better and patterns better than odd-shaped shot, without exception. The whole idea of buffered loads, moderate velocities, high-antimony shot and quality chokes is to lessen shot deformation, not the other way around. 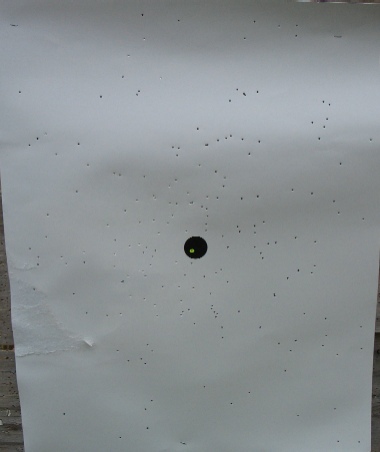 Here we have shot already deformed, so the chance of no deformed shot exiting the muzzle is right about zero. Hard lead is something like really stiff jello, so the idea of rimmed lead shot cutting has no basis, either. Another feature of the Prairie Storm loads are higher velocities, 1300 fps for 1-1/4 oz. 20 gauge and a blistering 1500 fps for the 1-1/4 oz. 2-3/4 in. 12 gauge offerings. High velocities generally do nothing to help pattern quality, either. Finally, the Federal Flight Control wad that promises tighter patterns with less constriction is generally true. It doesn't mean much to those who pattern there shells and change chokes as necessary to get the patterns they want at the ranges they want to shoot at, so the supposed benefit is elusive, but wads with no slits often do keep payloads together a bit longer after muzzle exit. Let's see how it did, Prairie Storm #5 shot, first with a Benelli M2 20 gauge with a Trulock Precision Hunter "Full" choke at 35 yards. 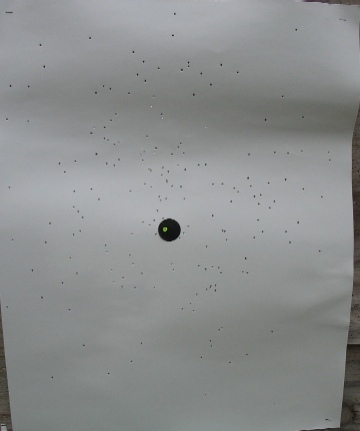 The next series of patterning tests was with a vintage Browning Gold 20 gauge, Trulock Modified Precision Hunter extended choke, again at 35 yards. While both patterns were certainly more than adequate to take pheasants at 35 yards, they aren't nearly the best lead 20 gauge shells out there. Perhaps a bit ironically, the best patterning 20 gauge loads I've ever tested are Federal shells, just not the Prairie Storm version. They happen to be the buffered, 1-5/16 oz. #5 Federal shells (also with Flight Control wads) that give more than adequate killing patterns past 50 yards, with more even dispersion than Prairie Storm loads. They are cited in this article as a result: http://randywakeman.com/Pheasants_Past_Fifty_%20Yards.htm . The fundamentals of pellet performance haven't changed. The rounder the shot, the better, a quality extended choke makes a noticeable difference with heavy payloads, and buffering (which these Prairie Storm shells lack) helps improve patterns. Snazzy marketing hyperbole drops more hunters than it does birds, as usual. 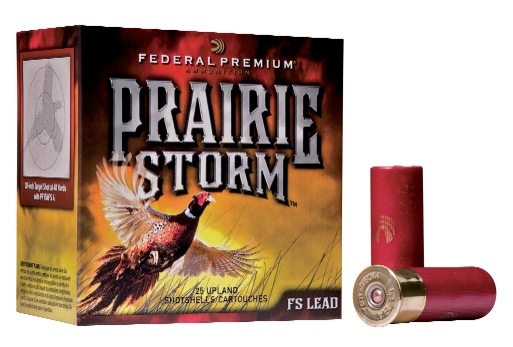 If you want the best 20 gauge lead pheasant shell on the market, try Federal Premium PFC258 shells. If you want the best 20 gauge turkey shell on the market, try the whopperdoodle Federal Heavyweight #7 1-1/2 oz. PHT258F shells. If snake oil and gimmicky hyperbole enchants you, there will always be shells with more puffery than actual performance. Federal Prairie Storm is far more sizzle than bacon. The future of higher performance no-tox loads remains with higher-density shot materials, not with just blowing the fluffy stuff fast, and the best lead loads remain comprised of hard, round shot at moderate velocities.